"Love & Friendship" feels like it was inevitable. The director Whit Stillman adapting Jane Austen is one of those ideas that sounds like it's made up because it's so perfect, like Wes Anderson announcing that he's going to make an animated film about foxes based on a book by Roald Dahl. What's wonderful isn't just that he's doing it, but that doing it makes certain aspects of his talent official. You could even say it's a wonder that it didn't happen sooner, or that, in his own way, he's already been doing it for years. Stillman's films, which include "Metropolitan," "Barcelona," "The Last Days of Disco" and "Damsels in Distress," are comedies of manners, about educated, often hyper-verbal people who are oblivious to how ridiculous they sound (even when discussing Austen's "Mansfield Park," as they do in "Metropolitan"). They pursue romantic partners that are wrong for them, suffer through relationships that are wrong for them, remain oblivious to better matches that are right in front of them. Throughout, the more brazen or ambitious characters run roughshod over people who have, well, manners. That describes a fair bit of Austen as well, although you might not necessarily know it from adaptations that concentrate on romance at the expense of comedy. Stillman doesn't make that mistake. 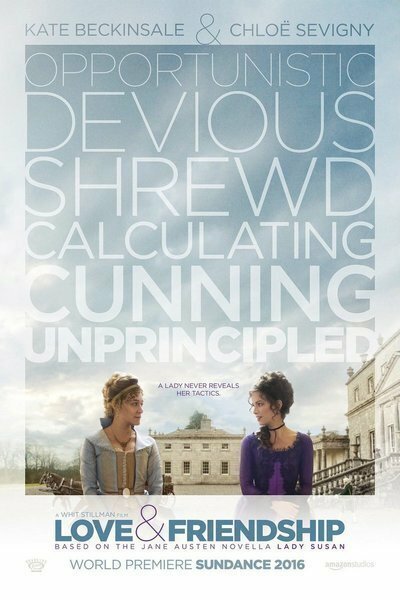 "Love & Friendship," about a scheming widow who tries to insinuate herself into a man's life, is based on a comparatively little-known and unfinished novella titled "Lady Susan" that wasn't published until after Austen's death. Most of the time, though, Austen-isms walk shoulder to shoulder with Stillman-isms so gracefully that it takes a moment to realize which author is likely speaking through these characters. It's a richly funny people-watching film, one that happens to contain possible romantic pairings. Kate Beckinsale, so delightful in Stillman's "The Last Days of Disco," returns here as Lady Susan Vernon, who recently lost her husband and is determined to find a new one for herself as well as for her daughter Frederica (Morfydd Clark), whom Susan frankly does not seem to appreciate or even like. Her target is Reginald De Courcy (Xavier Samuel), whom she meets while visiting the estate of her in-laws.. As Susan circles the poor man like a hawk, she also tries to facilitate the union of Federica and the exuberantly thick-headed Sir James Martin (Tom Bennett), even though Federica doesn't particularly care for him. Susan's confidant through all this is a Yankee, Alicia Johnson (Chloë Sevigny), who likes it in England and would really rather not go back to the states. That seems an increasing possibility as the movie goes on and Susan digs herself deeper into a pit of manipulation. Stillman pushes the comedy right up to the edge of screwball. He's exceptionally good at this sort of thing and he's at the top of his game here, positioning characters in the frame so that you can see their faces as another person says or does something that's so idiotic they can't believe it, or that is so obviously intended to deceive that they seem to be wondering if this is really happening or if it's a dream. Susan is a great character, easily one of the meatiest parts Beckinsale's been given, and she tears into it. Her life force is so immense that it might remind you of how underused she is elsewhere—how many roles she's played that require little of her besides posing and looking either pretty or formidable. Susan is distinguished by her audacity, not just in her wants and desires but in the way she talks to other people, turning subtext into text in a way most people would not do unless the person they were talking about was in another room, or another state. But they're standing right there! And they can't get their minds around how staggeringly rude and entitled Susan is—most of all Reginald, who's played with great precision by Samuel as a decent man who is so stunned by Susan's nerve that he can barely bring himself to reprimand her: he's too busy marveling at her existence. There's not a lot in the way of story here, though, and you should know that going in. The film is more of a series of situations, which might have been inevitable given that the novel is epistolary and summarizes developments that Stillman had to intuit or flesh out into scenes. After a while Susan becomes wearying, though not as wearying as she'd be if you were in the same house with her. Watching "Love & Friendship" is a bit like watching an nonexistent classic sitcom that happens to be based on Jane Austen, one with impeccable timing that dresses its characters in period garb. The direction, writing, photography and performances make it worth seeing, though—in particular Samuel's and Beckinsale's, and Bennett's brilliant turn as Sir James Martin, a grinning ninny who's so hilarious that you can't feel contempt for him, only affection. He's one of those characters who goes on and on, and just when you think you've hit a pause and might have a chance to finally escape, he begins a new thought or a new story and you're stuck with him for another five minutes. Stephen Fry also shows up as Alicia's husband, in a somewhat Oscar Wilde-ean turn that lets him put people in their places, something Fry does better than almost any actor drawing breath. Stillman has a sharp eye and ear for the way people excuse their inexcusable behavior, as well as for the reasons why other people might put up with their nonsense. This film is great fun. It's the sort of movie that fans will quote to each other to affirm membership in a secret club.